Once again, the owner of the billboard just outside the New York Times Building — a spot that often goes for more than $20,000 — approached us with a rock-bottom offer that was too good to refuse: $8,000 for the entire month of September, starting next Tuesday! This is our chance to let “the newspaper of record” know we’ll be keeping the pressure on them until they fulfill their journalistic duty to really investigate 9/11. 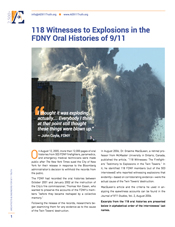 What better way to do so than to call attention to the very evidence sitting on their website: the FDNY oral histories they sued the City of New York to obtain 11 years ago — which include a staggering 118 eyewitness accounts of explosions. 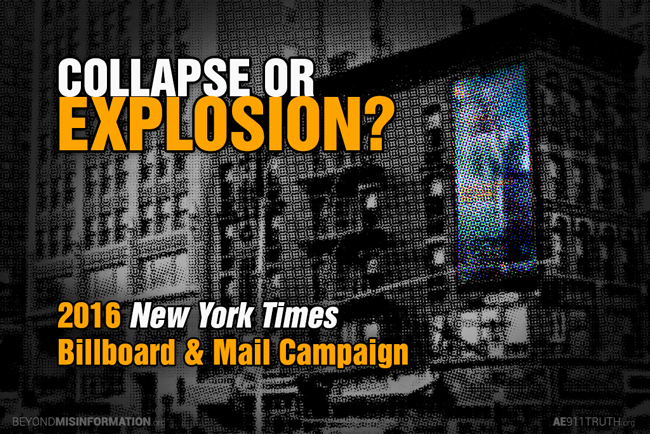 A Billboard AND a Mass Mailing! Oh, and let’s not forget, the billboard will be seen by an incredible 100,000 passersby each day throughout September! If we’re lucky, it’ll also stay up well past the end of the month, assuming no one else takes the space. (Last year, our ad in the same location stayed up until December!). Whether it’s publishing scientific articles or sponsoring spectacular billboards, we must get this message out in every way possible during the 15th anniversary of 9/11. Please chip in today and help us raise the $9K we need by next Tuesday to cover the billboard and mailing. Let’s make it impossible for the folks at “the newspaper of record” to go on ignoring the truth about the World Trade Center destruction!